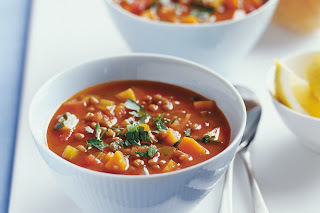 Do you find yourself eating more during the colder months? I think we all fall into that trap - when it's cold and miserable outside there is nothing like having some warm comfort food. You can, however, still eat healthy, helping you to stay in great shape. Try this amazing lentil soup - it's easy to make and tastes great. You will love it! Step 1: Heat oil in a large saucepan over medium-high heat. Add carrots, zucchini, celery and onion. Cook, stirring occasionally, for 10 minutes or until vegetables begin to soften. Step 2: Add tomatoes and stock to pan. Cover and bring to the boil. Reduce heat to medium-low. Simmer, partially covered, for 15 minutes or until vegetables are soft. Step 3: Add lentils to soup. Cook for 5 minutes or until heated through. Ladle soup into bowls. Sprinkle with parsley and squeeze lemon juice. Season with freshly ground black pepper. Serve with lemon wedges and bread rolls. Right! Pretty easy to make it. I used to have soups daily when i was in a physiotherapy clinic in Markham. Now i am back home and I will surely try this. Get back to you! !